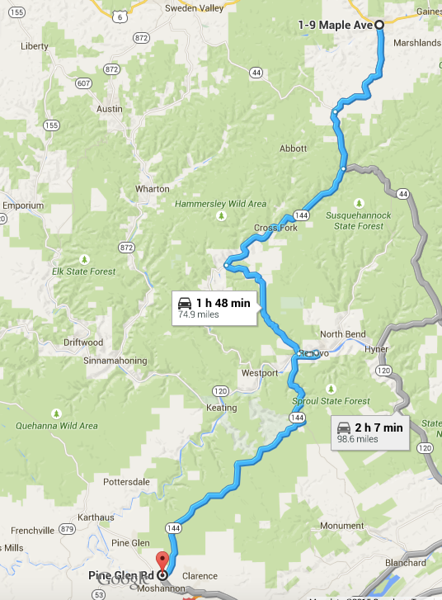 Making a left off of Route 6 in Galeton, I followed PA 144 south to what the map says is the town of Clarence. That stretch yielded about 75 miles of backroad rambling on good tarmac. 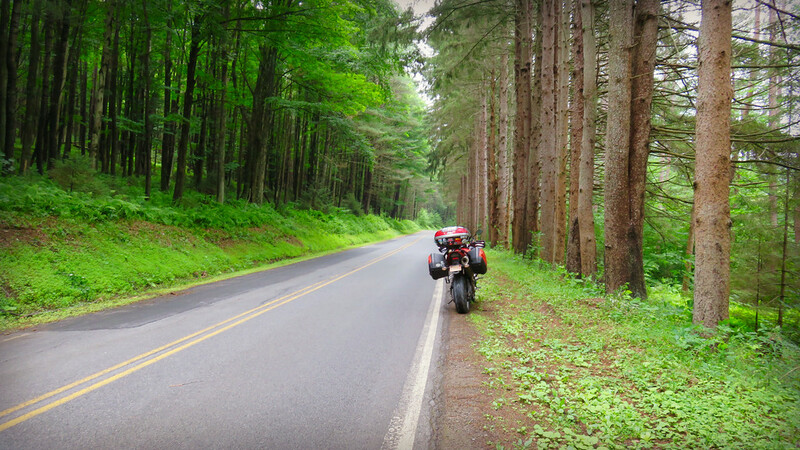 At the risk of sounding like a broken record… I saw little to no traffic as I rode along. I’m sure it helped that I was riding in the middle of the week while everyone else was at work. Even so, there was no shortage of “grass farmers” out tending to their yards everywhere I went. Lawn care seems like serious business in rural Pennsylvania. Here on Long Island, most people I know (myself included) have someone cut their lawn for them. A truck pulls up, the mower rolls out of the trailer and an army of men swoop through cutting, edging and trimming for all of 5 minutes. Then they pack up their circus and drive away like they were never here. The whirrrrrr of the weedwacker, nothing more than a memory. It is a precision operation. Mo’ lawns, mo’ money. The people I saw riding mowers appeared deep in thought, turtling along, cutting a path across their grass with deliberate care. Is there something to Zen and the art of Lawn Maintenance? Perhaps I’m missing out on something. 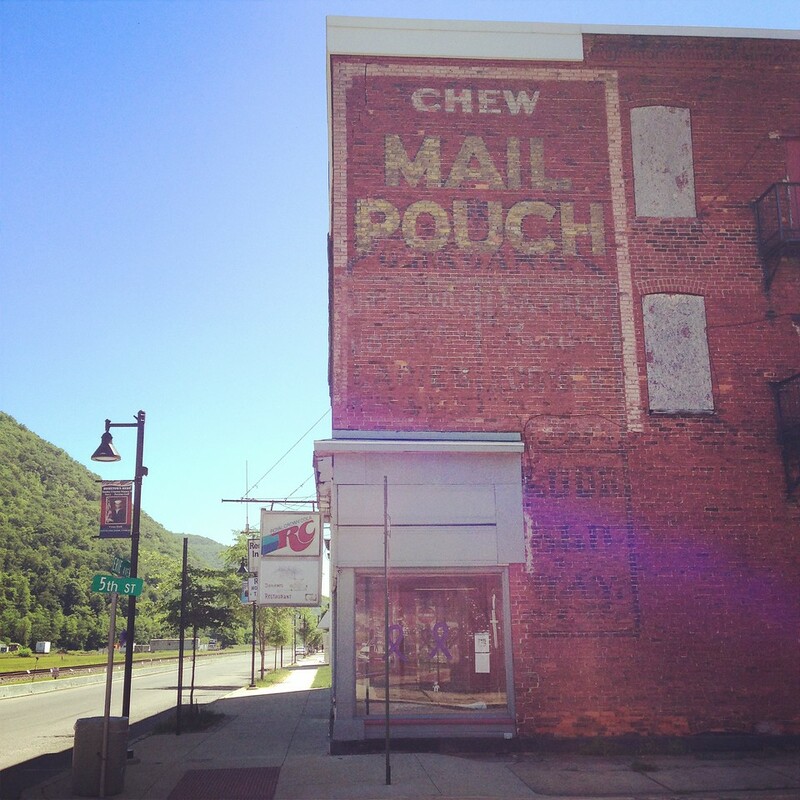 Whenever I pass through the town of Renovo, I’m struck by how it carries nostalgia in the very bricks that make up each building. It cuts the image of a town trapped by its own past. On the surface, there isn’t much going on save for a main street of largely empty buildings. But I suspect there are all sorts of busybody, goings-on in the lives of its inhabitants – just like anyplace else. 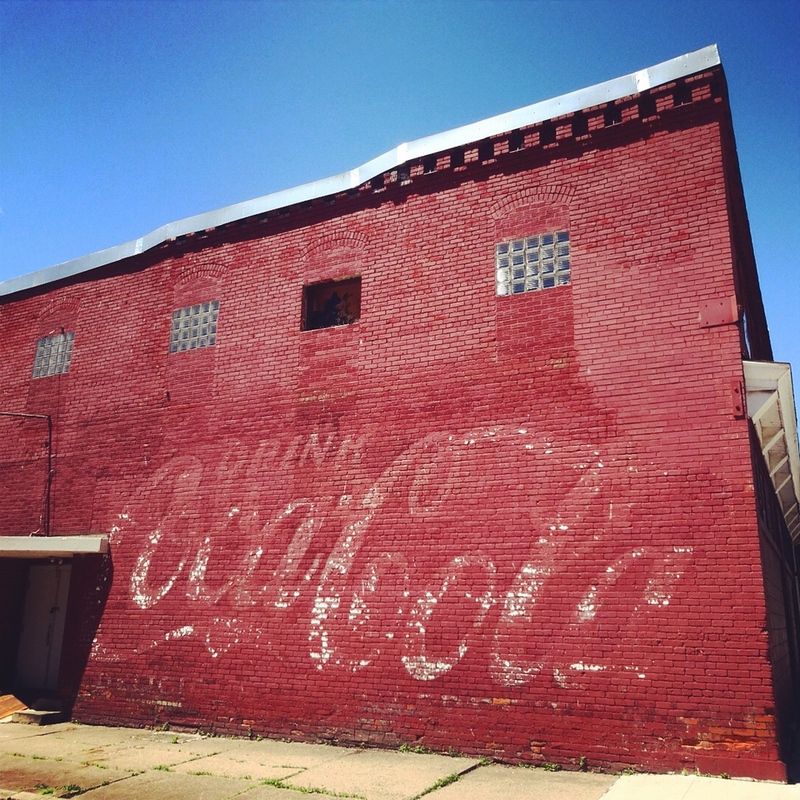 Renovo reminds me of an ember, a faint glow of its former self. That’s what I love about it. If one day I were to pass through and it was polished like a diamond, I think it would lose its appeal to me. And so it goes, I pressed on. 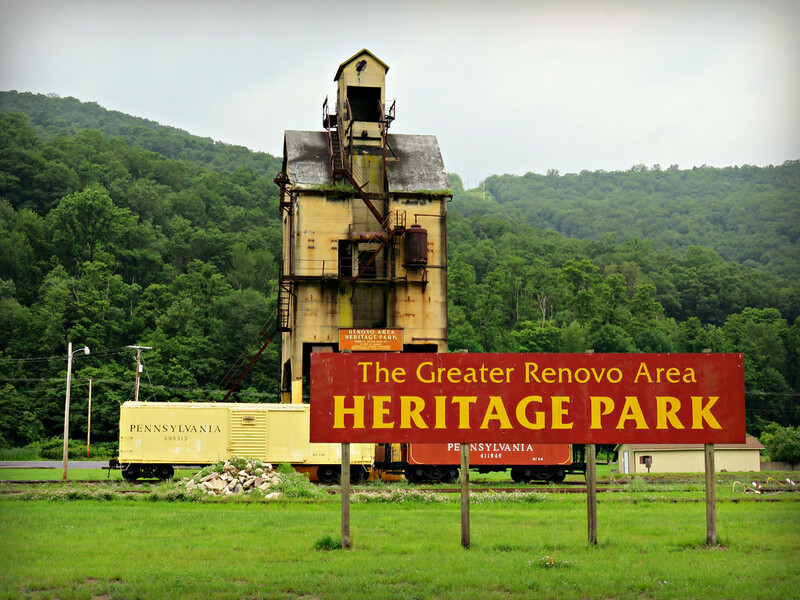 Fuzzy, my dear, methinks your time from the grind has conjured the poet in you (well, more than usual): “Renovo…cuts the image of a town trapped by its own past…reminds me of an ember, a faint glow of its former self.” What a delightful contemplation. As many years a grass farmer (whether I like it or not), I’ve yet to realize its Zen, to cut through to an epiphany, to trim down to some profound truth to share with the world. In fact, there are so many others who farm more grass than I, and have for longer, that I think the odds are pretty slim that it is I, little me, to whom a relevant cosmic truth would be revealed. In short–I don’t think you’re missing a damn thing. Time squandered farming grass would be much better invested on a bike. i think i’ll follow your advice and stay away from grass farming. maybe i’m mistaking the look of deep contemplation for near zombification? Grass farming … I never quite thought of it that way. I really like the way you make it sound so appealing. There are days when I absolutely love getting out and doing a little “grass farming”. On those I can be seen out gracefully skirting around gopher tortoise burrows and familiar, resident Sandhill Cranes as my mind drifts lazily from thought to thought and the experience can be very Zen. Other days, I’m out there falling into unnoticed gopher tortoise burrows and dodging overly-friendly Sandhill Cranes. On those days, it’s definitely just mowing the yard and I’d gladly pass on it. A few days ago, we had an absolutely beautiful day after many that were filled with violent thunderstorms and plenty of rain. Temperatures were in the mid-80’s, there was a faint breeze, and the humidity was pleasantly low. Oh wait! I was on the lawnmower and not the motorcycle that day … Okay, I’m with Ry Austin on this one. Pass on the yard work and go for a ride! Time better spent for sure! Thanks for the great photos and well written ride reports!